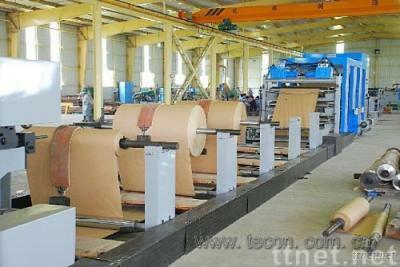 tecon package machinery co., ltd. This set formed by ZT9804 Tuber Making Machine and HD4916 bottom-sealed sacks Machine, high-tech program-controlling automatic producing line, using light, electricity, gas incorporate, over 20 Road craft work flow automatically completed by PLC photo electricity programmed control system. The pasting part of the machine arranged like trapezoid, materials complementary, the saving of raw materials degree greatly perfect, it is particularly important that the crew was not simply be multi-storey paper together, but through the use of high-tech program technology, multi-storey permits to control the maximum points, and the production of cement paste-paper bag solid good, low broken up rates, perfect shape, and is good for the stability of the cement quality. And also is available for the labor insurance and environmental protection. It is the only one recognized by the world cement paper sacks.